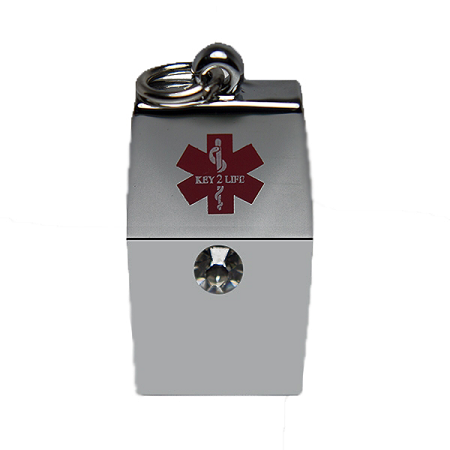 This EMR Medi-Chip Necklace with Swarovski crystal design and contains a Key 2 Life® (EMR) with USB Medi-Chip. 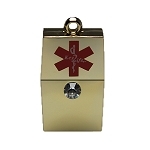 An individual utilizes this EMR Medi-Chip Necklace with Swarovski crystal to upload and store confidential electronic medical records. 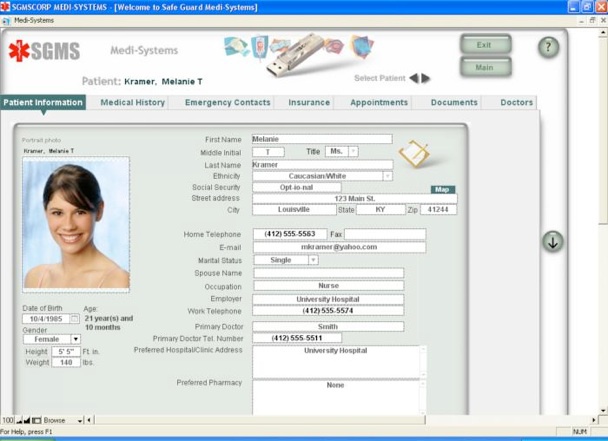 Access to confidential electronic medical records is urgent when a medical crisis arises. 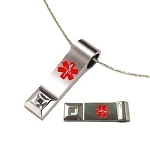 This popular EMR Medi-Chip Necklace with Swarovski crystal is light weight (2.5 ounces) and 100% waterproof. If your USB Medi-Chip becomes soaked with water from a pool or salt water from the ocean, rinse with clean water and dry with a hand towel. 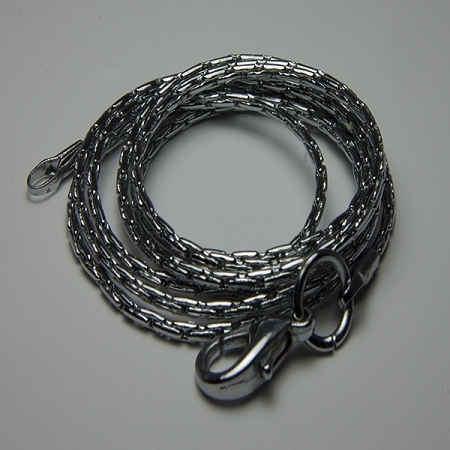 This product ships with a 24 inch chain. An accidental damage warranty is now available at a rate of $18.00 USD per year from date of purchase. This $18.00 USD accidental damage offer can be paid for in full once per year on the renewal date each successive year from the date of purchase. Alternatively, this accidental damage warranty can be paid twice per year, by making two incremental payments of $9.00 USD each six months totaling $18.00 USD under a split-payment offer. Great idea. Everyone should wear one. The protocol given by the company was way complicated and unnecessary. Sooo... I decided to erase the chip and use it to transfer a few pages of info from my word processor directly. Like a backup. Easy. The pendant looks cool , like a Mazuza. 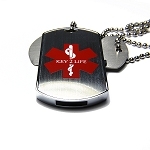 After researching around, I was really sold on the idea of having an EMR tag as a USB chip instead of just a '3-line dogtag' (as an example). Being able to put ALL my information onto the chip and have it ready in case of emergency seemed the better idea. Having the additional storage space for personal/emergency documents (like DNR's, Advanced Healthcare Directives, etc.) was also a big plus since most people aren't in the habit of carrying those with them when they head off to the ER. As for the unit I received, there were pros and cons. Start with the cons: The supplied chain was too short for a big/tall guy like me. I don't like messing with the little clasps and prefer to just be able to slip the necklace on or off over my head. I ended up having to buy a separate longer chain somewhere else. The chip itself fit very loosely in the retainer and the slightest jolt (like getting in and out of my car) caused it to fall out. I solved that problem by cutting out a little wedge of paper from a 3x5 card and fitting it in the receptacle so the chip had more to grab onto. Lastly, the glue holding the chip to the bottom part of the necklace gave out and one time when I pulled it off the necklace, the black chip part fell completely out too. One drop of superglue later, problem solved. As for working through all the screens to input your information, this is the "not intuitive" part. You don't get any "how-to" instructions, so it's best to take time to hunt around an experiment with entering/deleting records and information until you get comfortable with it before putting in your final (actual) information. It took me a while to figure out how to cut/paste "pictures" of things like my driver's licence, etc. into the various windows (spoiler alert: You don't cut/paste the actual pictures, just the files [like *.jpg or *.pdf] of the pictured/documents themselves.) Still, the basic idea of having a usb chip on hand in case of emergencies is a great idea and I'd recommend this to anyone. Another plus for parents out there is that you can store individual "records" on each member of your family. That way if another person in your family has an emergency, you have all their records with you in one source. Stay well, and good luck! 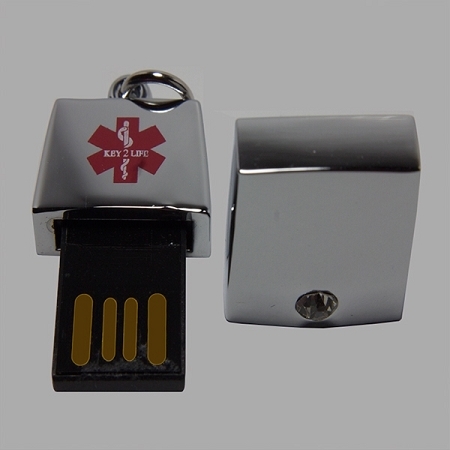 I liked the idea USB, but it was hard to get to the info and it did not show my medicine allergies on the page the for emergency personnel. I ended up returning it because I thought it would take to long for them to get the info to be pulled up and I would be given a medication I am allergic to since that did not show after it was put in two different areas. I recently purchased this item and I am impressed with the fast service, quality of the item and how much information it actually holds. All medical personnel I have showed it to are equally impressed. I highly recommend anyone thinking of purchasing this item to do so. I wear my necklace with the medical info for both my husband and myself, everyday. I showed it to my doctor and she was most pleased with it. I gave her the info I received with the necklace, she said she knew someone who would be very interested in it. Hope I can spread the word to more about these pieces, because I really do feel they are most important.